Target audience: Nonprofits, cause organizations, foundations, NGOs, social enterprises, businesses, digital marketers, educators, Web publishers, Pinterest users. 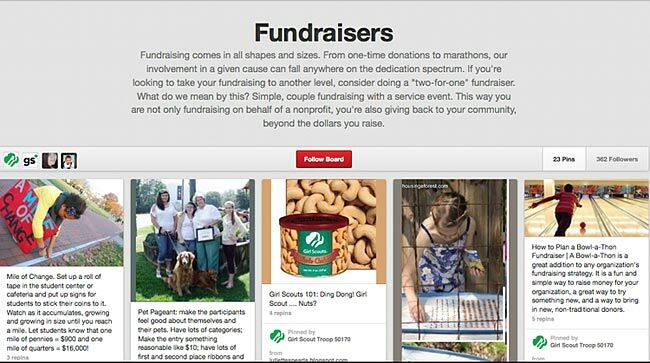 Earlier this year, I wrote about 13 nonprofit Pinterest board ideas. If you have a Pinterest account for your organization, you’ll find some inspiration below. 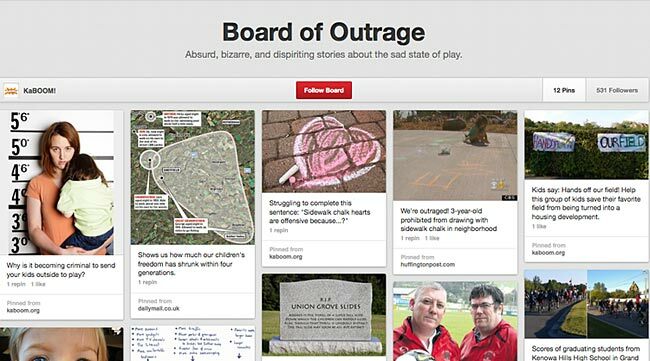 If you don’t have a Pinterest account, take a look at how these nonprofits are leveraging this powerful visual medium. 1AARP does a great job of this, showcasing celebrities over 50 and other influential people. Who in your movement has made a difference over the years? This is a great place to show them off and briefly tell their stories. 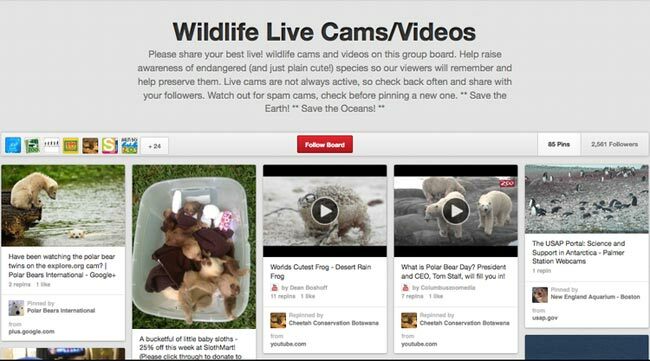 2For example, the National Wildlife Federation has a board aggregating live wildlife cams from around the world. 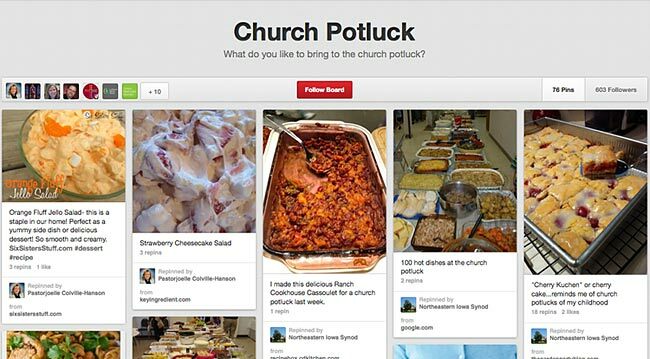 3The Northeastern Ohio Synod of the Evangelical Lutheran Church in America has a board with church potluck recipes. 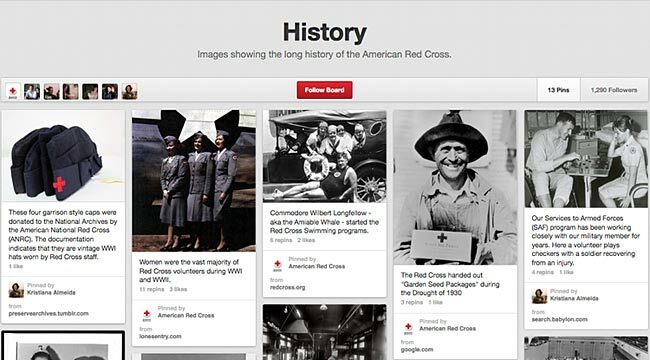 4The American Red Cross has a board about the early days of the organization’s existence, showcasing key members and events. 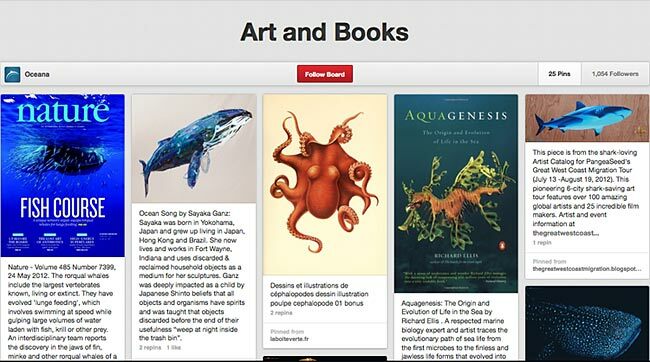 5Oceana has an interesting board of art and books related to ocean conservation — take a look above! 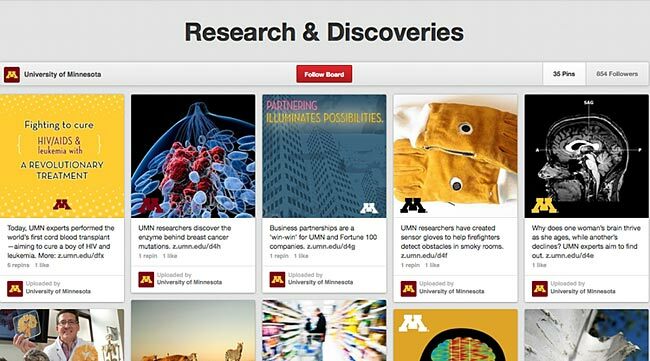 6The University of Minnesota shares recent scientific discoveries made at the university — I like the sensor gloves. 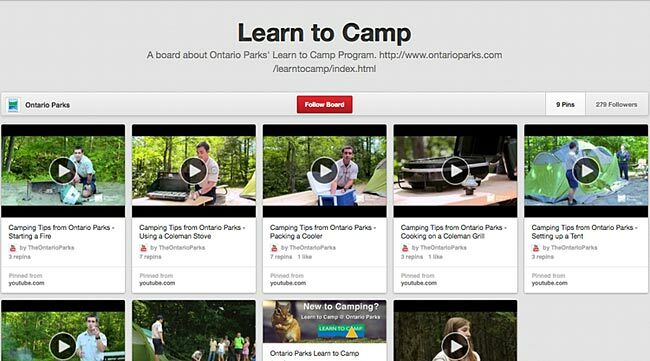 7Ontario Parks teaches people how to camp with this Pinterest board. Another of their boards features recommended camping equipment – a great resource for people just starting out. 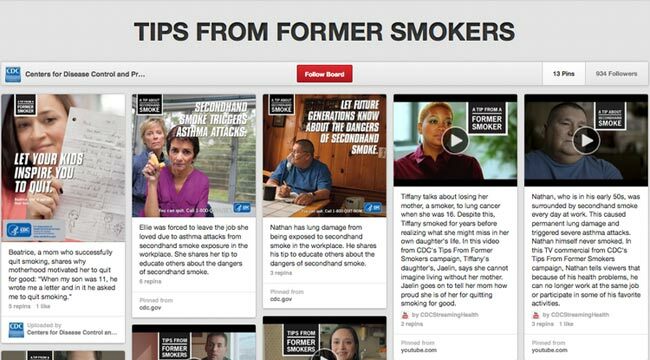 8The CDC has tips from former smokers, which serves not only as a valuable resource for people checking out their pins, but also is a great way to shine a spotlight on the people their organization serves – letting them tell their own stories. 10Do your members do any P2P fundraising? Give them ideas how to come up with the money they need to participate in your walkathon or other events with a Pinterest board. Girl Scout Troop 50170 has this helpful board of fundraising tips and ideas. 11Not only is this interesting content for members and donors, it’s a handy resource for media relations. 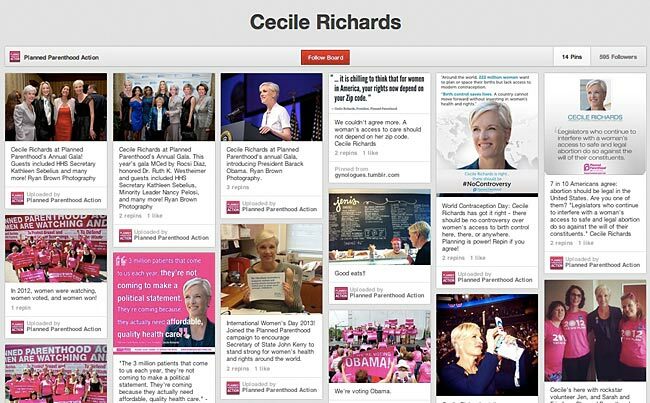 Planned Parenthood has a board with the latest photos and quotes from their CEO, Cecile Richards. Cool to see all these examples, Annie. Thanks for sharing! These are such great examples. Without much effort, my Pinterest actions develop much interest. In seeking how to become better at it, I found your very insightful post. Thank you for taking the time to assemble such great examples. Thank you! 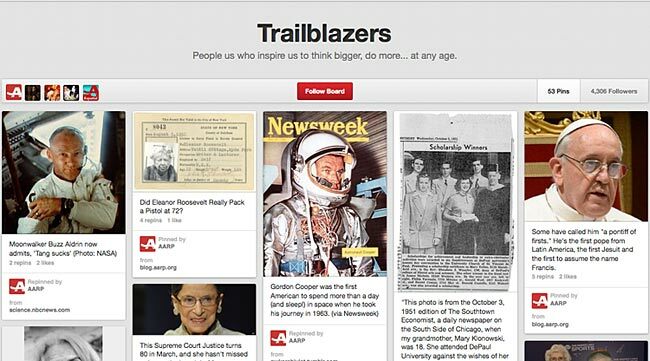 I’ve been looking for use cases for how Pinterest can be used on the organizational level. Great list!